La Foundation Bill Gates a vendu ses parts dans l’entreprise G4S. G4S est une entreprise qui contracte avec les prisons israéliennes en matière d’équipement et d’organisation (plus d’info en cliquant ici). Une campagne internationale de la société civile a encouragé la fondation Bill gates d’agir en ce sens. In the face of worldwide pressure, the Gates Foundation has sold down its shares in the world’s largest Private Military and Security Company, G4S. Over 100 Palestinian and international organisations, including War on Want, launched a campaign calling on the Gates Foundation to divest its £110m stake from the company. Thanks to everyone who joined the campaign, signed the petition and participated in protests. 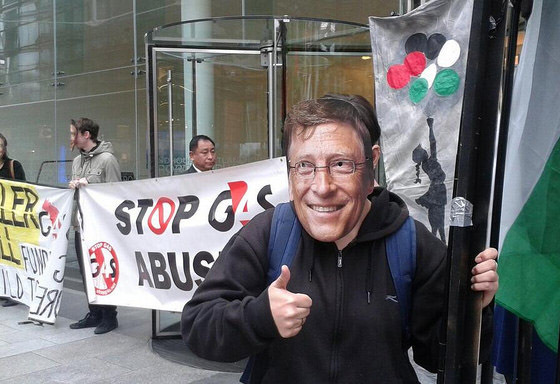 “We are glad the pressure on the Gates Foundation to divest from G4S is starting to work. We urge the Foundation to sell any remaining shares it still holds and release a public statement pledging not to invest in corporations profiting from Israel’s military occupation,” said Rafeef Ziadah, Senior Campaigns Officer at War on Want. The impact of the Gates Foundation, as a major shareholder, divesting the majority of its shares from G4S will be felt within the company. Campaigners will continue to target all G4S shareholders and contracts, especially in the Middle East, until the company can no longer ignore the damage its contract with the Israeli prison services is having on its reputation and profit margin. G4S is highly complicit in the Israeli military occupation of Palestine and is particularly complicit in the imprisonment of the over 5,000 Palestinian political prisoners, including child prisoners. In 2007, the British security company G4S signed a contract with the Israeli Prison Authority to provide security systems and other services for major Israeli prisons. Beyond Israel’s prison system, G4S also provides equipment and services to Israeli checkpoints in the West Bank that form part of the route of Israel’s illegal Wall and to the terminals isolating the occupied and besieged territory of Gaza. Universities, banks, charities and trade unions across the world have terminated contracts with G4S over its role in Israel’s prison system, costing the company millions of pounds. But G4S has refused to sever ties with the Israeli prisons authority. Our continued efforts to hold G4S to account are needed today more than ever. On 24 April 2014 approximately 100 Palestinian administrative detainees launched a mass hunger strike in response to their continued detention without charge or trial. Most of those on hunger strike have now gone 35 days without food. On 28 May 2014, 40 of them were transferred to hospital as their health deteriorated rapidly. The Israeli authorities immediately imposed a number of punitive measures including : the immediate isolation of all those on hunger strike. On 5 June, G4S will be holding its annual shareholders meeting. War on Want will be there to send a clear message that profiting from Israel’s illegal military occupation is unacceptable. Join us !